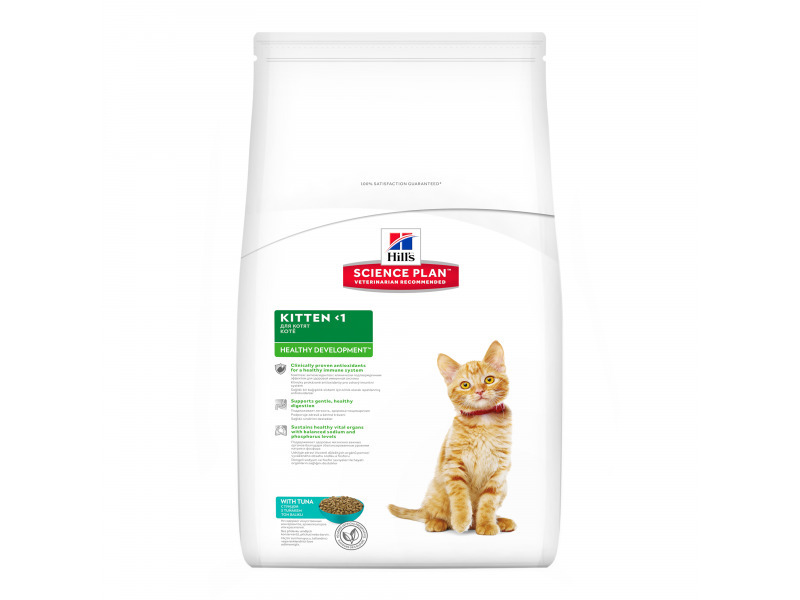 Hills Science Plan Kitten is a complete food with Tuna that has been specifically formulated for kittens under 1 year old. It has been adapted cater for the needs of growing kittens. It will provide your kitten with a balanced diet and complete nutrition to help to maintain optimum health. Fish Oil (DHA) will help your kitten to have healthy skin and joints, and added antioxidants will boost the immune system.The food contains balanced sodium and phosphorus levels to help vital organs. Science PlanTM Kitten should be fed from weaning to maturity at 1 year old. Kittens can usually be fed an unrestricted amount of Science PlanTMKitten, although the following feeding guide can be used as a starting point for 2-4 meals per day and the amount adjusted to achieve/maintain optimal bodily condition. Pregnant queens can usually be fed an unrestricted amount of Science PlanTM Kitten, although the feeding guide can be used as a starting point and the amount adjusted to maintain optimal bodily condition. Lactating queens should be fed unrestricted amounts of Science PlanTM Kitten (i.e. fed ad libitum) until weaning is completed. An 85g can is equal to 25g of the dry food and a 156g can to 45g. Supports optimal brain development to increase alertness and quicken reactions. High Meets energy requirements without the need for large meals. Minerals, including calcium Increased, but controlled Provides optimal balance for growth and development. Promotes strong teeth and bones. Target urinary pH Acid: pH 6.2-6.4 Supports urinary tract health. Formulas 2 Dry, 1 Canned, 4 Pouches Increases choice to encourage acceptance. Ingredients: Tuna: Chicken and turkey meal, maize, animal fat, tuna (8%) meal, maize gluten meal, flaxseed, digest, minerals, dried beet pulp, fish oil, vitamins, taurine, trace elements and beta-carotene. With a natural antioxidant (mixed tocopherols). There are currently no questions for Hills Science Plan Healthy Development Tuna Kitten Food - be the first to ask one!